SSDs (solid-state drives) and SD (Secure Digital) cards have a limited number of writes before they wear out. To get the most out of this storage type lets investigate, then make a few adjustments to maximize the life of your SSDs and SD cards. Article refreshed from 3 years ago. See MySQL tuning and PHP performance tips. 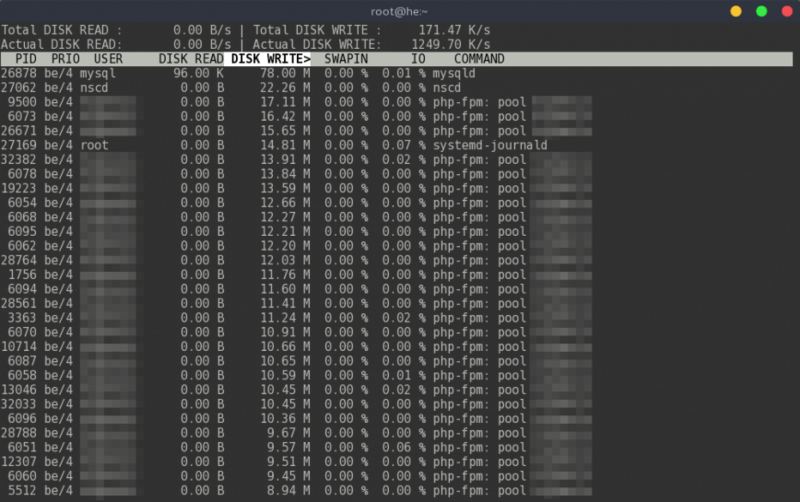 You cannot always eliminate all disk I/O especially for services like MySQL and PHP (pictured above). What you are looking for are processes hogging disk I/O without good reason. Below are general tips for avoiding some common disk overhead. Using the noatime mount flag in the /etc/fstab file stops the logging of read access times to the file system. The noatime mount flag eliminates the need for the system to make timestamp writes for files which are simply being read. Since writes are more expensive this often results in measurable performance gains. This is a recommended tweak for SSDs and SD cards on systems using a swap partition, this will reduce the “swappiness” of your system, thus reducing disk swap I/O. On Debian/Ubuntu (or Red Hat/CentOS) add or modify the following in /etc/sysctl.conf (or the equivalent config file). If you have lots of free RAM and understand the risks, you can avoid adding swap completely, or just use this instead. For journalctl you can tweak this in /etc/systemd/journald.conf. If you’re not optimizing a web server and you use Firefox, Chrome, etc., then install the profile-sync-daemon. The Profile-sync-daemon (psd) is a tiny pseudo-daemon designed to manage your browser’s profile in tmpfs and to periodically sync it back to your physical disc (HDD/SSD). Consider switching from the CFQ to NOOP or Deadline. Both offer better performance on SSDs and SD cards. TRIM allows Linux to inform the SSD which blocks of data are no longer considered in use. Therefore, when you delete a file, your SSD is now able to write data to blocks as if it they were brand new without having to perform the cumbersome deletion process. In essence, TRIM makes sure that your SSD’s performance doesn’t degrade too much with use. This will run every day to avoid slowing down your writes. EDIT: Using a Linux distribution which supports TRIM by default (ex. Ubuntu 14.04+) is helpful. — Use larger SD cards. Writes are spread based on the size of storage, so the larger the storage, the less it will repeatedly write over the same areas, less wear. — You get what you pay for. Cheap SSDs and SD cards usually will not last as long or perform as fast. Join over 30,000 subscribers who never miss a blog update! Subscribe and receive a free PDF list of 101 useful Linux commands.